The 2013 Travellers Series consisted of 6 events with 4 to count. 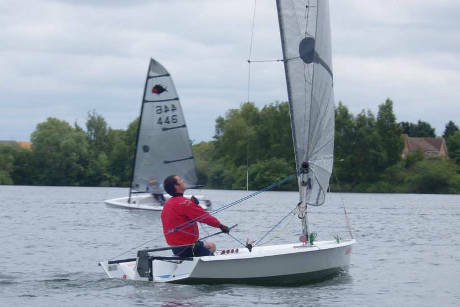 The first 5 events all had different winners, but the eventual victor Sam Davy managed to secure a second victory, and the series at the Inlands at Grafham. Kathryn Hayfield beat Martin Tubb at Graham on countback, and thus Martin was pipped to second in the Travellers Series on count back by Dave Harris. 2013 was probably the closet fought season with 5 helms vying for second place going into the final event and only 2 points separating 2nd to 5th place. 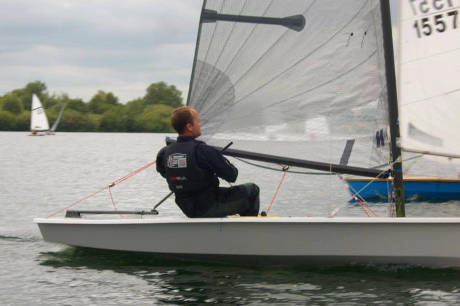 In stark contrast to the predominately strong winds of 2012, 2013 was a season of light wind Opens, and Sam's victory for a second year shows that he is able to master a variety of conditions. Five intrepid Solution Sailors took part in the MWH Challenge with the dual aim of getting fitter and raising money for the British Heart Foundation. The team finished fourth, having sailed, walked and cycled 1200 miles, and raised over £200. 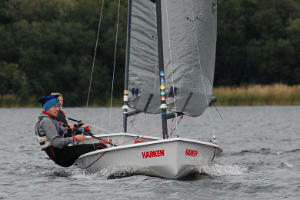 The Solution class finished off their 2013 Travellers Trophy at the Ovington Inlands at Grafham over 16&17 November. The weekend offered some of the closest racing seen all year as the 5 sailors played snakes and ladders with their positions. 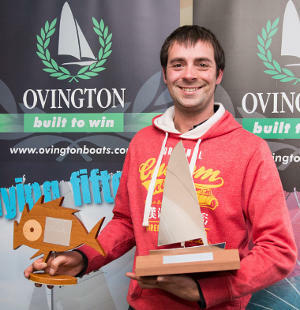 Once again Sam Davy proved that the good sailors are always lucky by managing to finish first in 4 of the 6 races, taking both the Inland Championship and the Travellers Trophy in doing so. 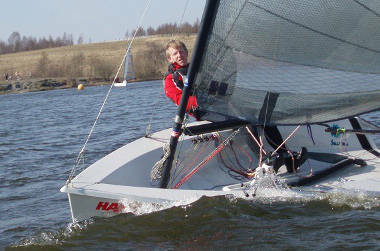 Dave Harris won the races that Sam didn't which was enough to secure runner up for both trophies. Kathryn Hayfield stole 3rd place in the Inlands from Martin Tubb on count back, but in return Martin finished 3rd in the Travellers series. Kevin Clark, with nothing to play for in the Travellers series, was free to escape the freezing cold and wind-less conditions of Sunday. He was lucky enough to be able to accept 5th place in the Inlands and chose to play with Ovington's new VX One instead. Due to commitments elsewhere and lots of clashes of events only the hardy few made it to Northampton for the penultimate open of the year. They missed out on great weekend sailing. Sunshine and a reasonable breeze settled in for shorts and tee shirt sailing in October!! 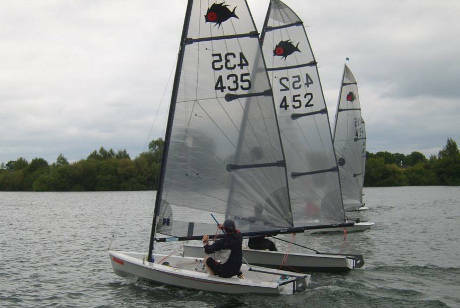 The Solutions started after the OK's who were sailing their inland championships but had to wait around a while as the OK's were a bit keen and had two recalls, a black flag seemed to focus their minds and the game could start at last. Race 1 Dave Harris got to the windward mark first after a slow start from Pete Warne but wasn't to enjoy that position for long as Pete reeled him in on the reach and held his lead to the finish with Mark Crowther not far behind. Race 3 The wind dropped off a little for race 3 which seemed to favour Dave who took the bullet comfortably and Mr consistency Crowther followed Pete over the line for third. Race 4 This was a repeat of race 3 in dying wind leaving a two horse race overnight with Dave and Pete tied with two firsts and two seconds each, Mark had all but secured third and everyone enjoyed Northampton's hospitality and a few beers. Day two dawned with a flat calm and little chance of the early start that the race officer planned. After an hours delay we all launched into what looked like being a drifter, how wrong we were. Race 5 The race officer got it spot on and the best wind of the weekend appeared from nowhere. Dave again got to the windward mark first after negotiating the wind shadow of the running OK's better than the rest by going right early. 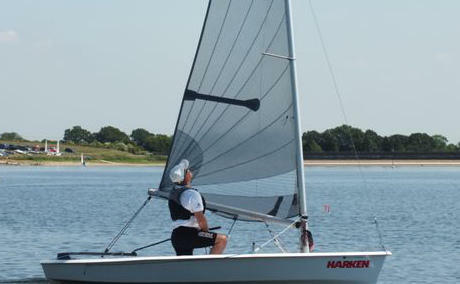 He wasn't going to have it all his own way however, and Pete pushed hard on what was now a planing reach he rolled over Dave to get an overlap at the leeward mark and then held his position to the finish. Dave stayed ahead of Mark to leave a nail biting last race where whoever got the last bullet won the event. Race 6 Dave and Pete were locked in a match race for the start and Dave overcooked it when pushing Pete over at the start only to find they were both over and had to sail to the pin to go 'round the ends' this left a lot of work to do and Dave knew that as things stood it was all Pete's but for Dave only a first was good enough. 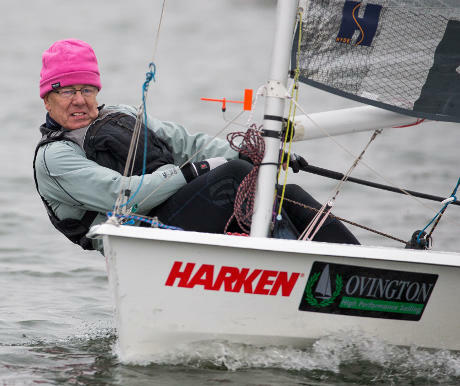 Dave found some downwind speed from somewhere and gybed at the first leeward mark with a chance that he took and secured the event after a real battle. Pete and Dave finished with the same points 1,1,2,2,1,2, and 2,2,1,1,2,1, respectively and a big thank you goes to Northampton Sailing Club and especially the race team who gave us some great courses by moving marks when we had some big wind shifts and giving us true beats and runs when many would have struggled. 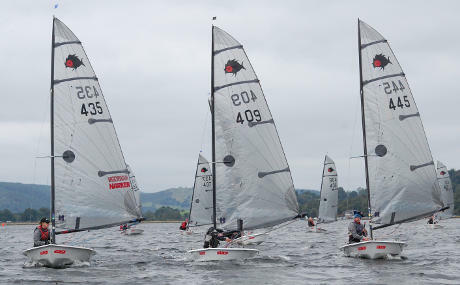 The Solution National Championships took place at Bala Sailing Club on 24 & 25 August 2013. 14 Solutions congregated on the beach on Saturday morning, grateful that the usual 'Bala blast' was missing but dismayed to see that the wind was coming off the hills. The "regulars" were pleased to see so many new faces in the fleet although by the end of the weekend everyone was classed as a "regular"! The fleet set off down to the start line ready for race 1. Andy Bayliss set the tone for the event by taking a clear lead while the rest of the fleet started as they meant to go on... with a game of snakes and ladders. Multiple place changes ensued with Phil Manning eventually finished 2nd and Sam Davy in 3rd. Race 2 saw the fleet joined by the 14th entrant as Ron Goss managed to extricate himself from an unscheduled morning at work. This was yet another game of snakes and ladders as the wind dropped even further. Despite all the place changing during the race, top 3 finished in the same order: Andy Bayliss, Phil Manning, Sam Davy. With no sign of the wind returning, the race officer decided to postpone race 3 until Sunday. When Sunday morning dawned, the lake was a perfect mirror. With tea being drunk and boats being tuned, the race officer hoisted the postponement flag. As if on cue, the wind filled in, although once again coming over the hills. Race 3 saw a shake up in the results, with Phil Manning taking first ahead of Andy Bayliss. Sam Davy held his customary 3rd place and the remainder of the fleet continued with the game of musical chairs. Normal service almost resumed for race 4 - Andy once again held the top spot but Sam pipped Phil to second. 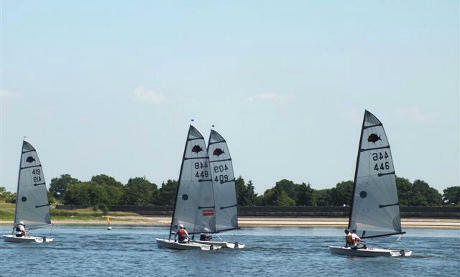 After lunch, the fleet went back out for the final 2 races. Phil decided to really shake things up by taking another first place and therefore opening up the possibility of the championship. Kevin Clark also put a spanner in the works by finishing 3rd just behind Andy, relegating Sam into 4th place. With everything now to play for, Phil had to make sure he won the last race if he was going to steal the championship. Unfortunately for him, Sam got away to a great start and took an early lead. Phil was hot on his heels but Andy was never far away and never quite gave him room to attack. In the end, it was Andy who managed to overhaul Sam for his fourth victory, while Phil was left with 3rd place. Once the music had stopped, it was easy to figure out the top 3 places but the rest of the fleet were totally in the dark as to where they might have finished. ven more confusion ensued when it came out that 3 boats had missed a mark out in race 5 but only 2 of them were retired in the results. After a bit of debate, the results were finalised and the prize giving began. 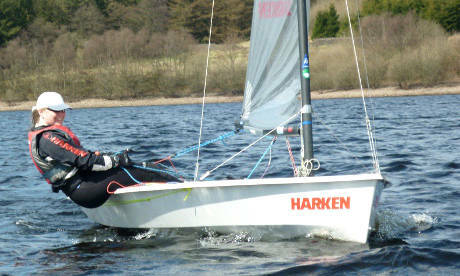 Once again, Harken were very generous with their sponsorship so there was a prize for everyone in the fleet. 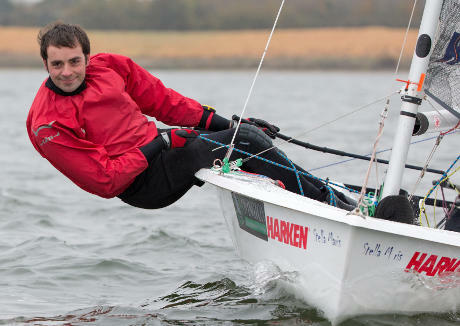 The Solution class would like to say thank you to Bala sailing club for hosting yet another great championships and once again a big thank you goes to Harken for their continuing support. 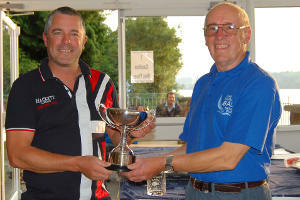 The Ted Funnell Memorial Cup was won by Kathryn Hayfield for finishing mid fleet. The third event of the 2013 Solutions' travellers series was help at Blithfield on the hottest day of the year. On arrival there was a light but sailable breeze but by the time the competitors has rigged this had completely vanished and racing was postponed with many fearing that it would be abandoned altogether. However perseverance paid off and after a couple of hours socialising in the sun the wind returned. 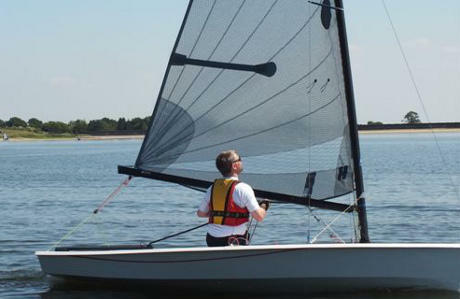 The race officer was quick to make the best of the conditions and set a rectangular course. The Solutions started as ever in a gentlemanly fashion and 6 boats set off 2 minutes behind the Phantoms. Sam started mid-line and at the windward mark split Dave and Martin coming from the committee boat end. The wind was still fickle and the leg down to the clubhouse changed from a run to a beat, with a 180 degree swing across the course. By the end of the first lap, after many changes in position Sam, Dave and Pete were leading with Kathryn and Mark having their own battle behind and Martin had slipped back to bring up the rear. 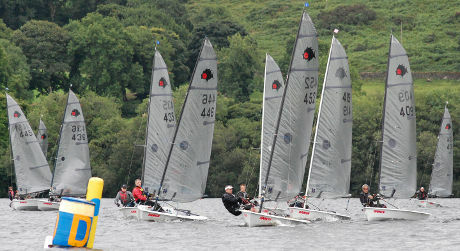 The fleet started to bunch up again on the second lap as the Solutions caught the Phantoms. In the beat to the downwind mark(!) Martin and Pete went right, while Sam went left. In what was a game of snakes and ladders, with a gaggle of Phantoms blocking the wind, Martin landed the ladder while Sam hit a snake and Martin rounded the leward mark first to steal victory, with Dave slipping through into second. The race officer waited to see if the wind would settle, before wisely deciding it was lunch time. With the temperature hitting 30 degrees the Solutions decided over lunch and gallons of orange squash to not have another sauna like experience and left it to the Phantoms to sweat out a second race. Sam is still leading the Travellers' series by 3 points with Martin now second and Kathryn third. However this can all change at the nationals. 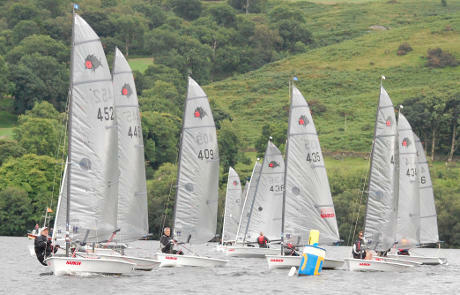 Hopefully there will be a little more wind at Bala, but will it be enough to suit Kevin Clark? The second event of the 2013 Solutions' travellers series was help at Hykeham on 8th June, in conjunction with the Streakers. 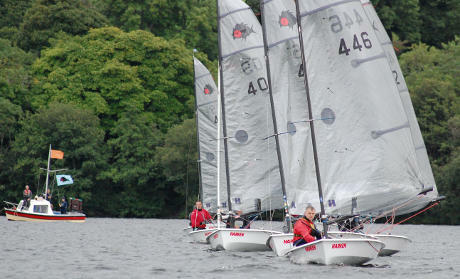 Competitors enjoyed a warm and pleasant, if somewhat overcast day. The wind was mainly light and shifty, but with good gusts and generally better than had been forecast. The race officer made the most of the prevailing conditions and set a full length beat followed by a series of reaches and runs. The first beat through the reaching Streakers added some boat on boat excitement, but this became easier as the Solutions gradually wiped out their 5 minute lead. In Race 1 Nathan Batchelor set off to an early lead showing the rest of the fleet the transom of his brand new boat, closely followed by local sailor Sam Davy. Despite almost sailing the wrong course Nathan held onto his lead to the end. 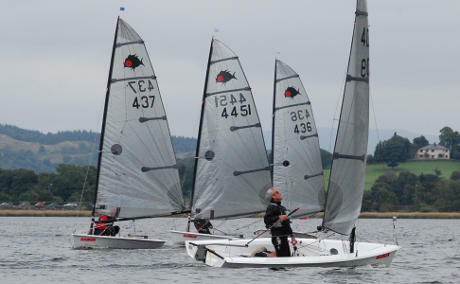 Martin Tubb started to catch the leading pair, but then fell back. Race 2 after lunch was a repeat of race 1 except Kathryn Hayfield headed up the chase after the leading pair and took third just ahead of Kevin Clark. Several boats were OCS at the start of Race 3, but nobody was quite sure who was over, so just to be sure virtually the whole fleet generously backtracked and restarted. As the wind shifted frequently it became key to select the correct side of the beat and positions changed frequently, although Sam consistently stayed ahead of the other contenders to secure second overall. Martin sneaked home just ahead of Kevin and Kathryn to take third spot. After a great day of friendly competition on the water and general banter ashore, Nathan was the worthy winner, proving that it’s always great to have a new boat. Sam came a close second showing the competitive longevity of the Solution. 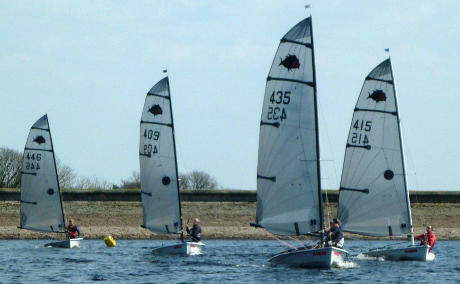 Everyone enjoyed the event, and sailing with the Streakers, and look forward to Blithfield in a month’s time. 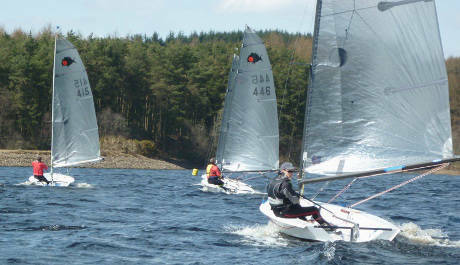 The first event of the 2013 Travellers Series was the Delph open on 20th April. The day dawned bright and sunny with a nice breeze blowing in from the dam wall. 4 visitors joined the 3 home boats for a beautiful day’s sailing. Martin Tubb showed that the recent race training at Leigh & Lowton was worth attending as he took an early lead in the first race. Sam Davy showed his determination to hang on to the Travellers Trophy for another year by being a little too keen on the start line. After being called back, he set about closing down Martin’s lead. Pete Warne also put in an appearance at the front of the fleet before the first race finished with Sam in 1st, Martin holding onto 2nd and Pete 3rd. Race 2 was more of a game of snakes and ladders. Place changes were too numerous to track and at least 4 different boats appeared at the front at different times in the race. When the music stopped, Kathryn Hayfield was holding onto first place with Sam in 2nd and Pete once again 3rd. With everything to play for in the last race, Sam took a decisive lead and held onto it to the end.Pete was looking a confident second until he was struck by a senior moment and missed out a mark, letting Kevin Clark and Kathryn through and only just holding off Martin. With a bit of determination Pete was able to recover to his customary 3rd place while Kevin hung onto 2nd. Sam Davy was a worthy winner of the event while second to fifth were very close overall. In the end, Kathryn Hayfield squeezed through to 2nd and Kevin Clark was 3rd. Pete Warne was punished for finishing consistently 3rd, coming 4th overall. 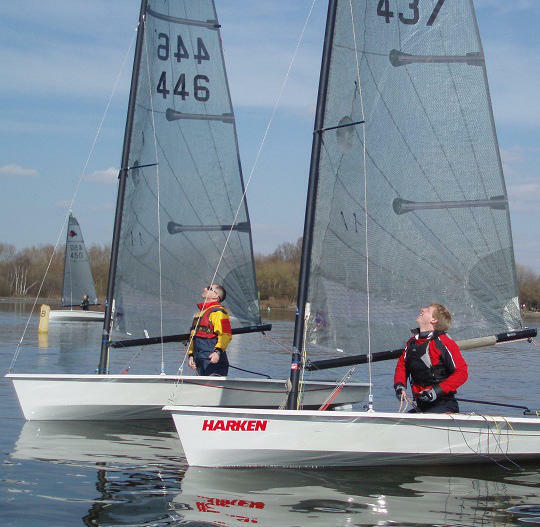 The unseasonably cold weather and poor wind forecast put some off, but 4 Solutions attended the training day on Saturday 6th April at Leigh and Lowton. Thanks to Ollie Shaw (Phantom fleet) for arranging the day, and Dave Eccles for providing the coaching. Spring finally arrived and we were met with bright sunshine but no wind. The morning was spent on the lawn looking at boat setup and race tactics. Luckily the wind filled in after lunch and we had two on the water sessions to blow away the cobwebs and practise boat handling, race starts and mark rounding. 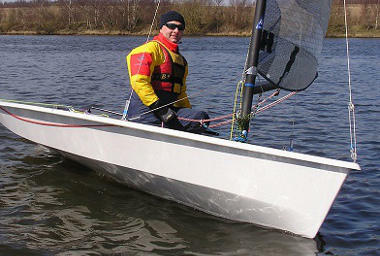 It was good practise in varied conditions, ranging from no power to full power. 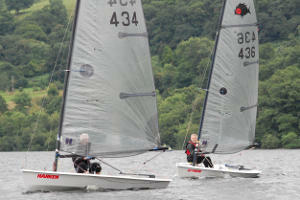 The Solutions did well to keep up with the "pie eaters" and managed to get in amongst the action at the windward mark.